Discussion in 'Patriots Draft Talk' started by scott99, Feb 8, 2019. Last year, my favorite player was Sony Michel. He was my favorite, because I thought he’d be perfect for the Pats, a perfect replacement for Dion Lewis. Turned out, he was perfect for the Pats, albeit not exactly a Lewis replacement perse. Sony never really got involved in the receiving or return game like Lewis, but he’s a better runner, and had a GREAT rookie season. I was thrilled when the Pats drafted him. This year, my favorite player in the 2019 draft, is WR Hakeem Butler, WR Iowa State. Butler is 6’6” 230 lbs, and would be a good replacement for Josh Gordon. Excellent red zone target, and I’d like the Pats to get him, because in the SB it was painfully obvious that only Edelman and Gronk were getting open. Because of Butler’s size, he’s open even when covered. I think he’d be a monster in the Pat’s offense. Extremely talented with great hands. Interested in seeing what he does at the combine. Another guy I like is David Sills WR West Virginia, I think he’d be a great replacement for Hogan. I’d also love seeing his QB (Will Grier) in a Pat’s uniform as Brady’s eventual replacement in 3 years or so. Who is your favorite player in the 2019 NFL Draft ? I like David Sills V also. 6'5 former QB, vertical threat. Exactly what the Pats need. and looks like he can be drafted in the mid rounds. Earlier rounds I like Deebo Samuel, AJ Brown, JJ Arcega. 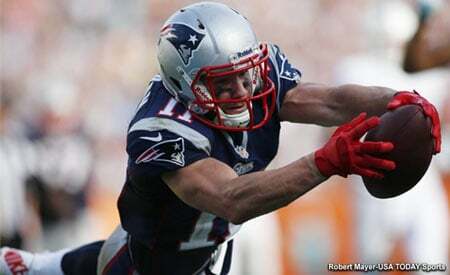 Pats gotta double down at WR again this year and hope it works out better than last time. I like JJ Arcega-Whiteside as well, he reminds me of Larry Fitzgerald. Deebo Samuel is probably someone who is more a Patriot type player than any WR in the draft. Still early in the process, but I can chalk up TE, Isaac Nauta, Georgia as my first official binkie. Tough, nasty, great blocker and I think his offensive abilities were held back in the Bulldogs schemes. I haven't gotten too deep into this years draft yet but there are a few players I really like so far. If I had to pick one binky though it's got to be Daylon Mack, DT from Texas A&M. He's going to be a mid round pick but I think he has a chance to be a really good player in the NFL. Mack is a former 5 star recruit who flashed huge potential early on but never fully put it together. Up until last season he could have probably been considered a bust, but a coaching change this past season really helped improve his game and find some consistency. He carried that on with an excellent Shrine Game and Senior Bowl, being absolutely dominant at times. Mack is 6'1" 320lbs (already down from the 335lbs he played at A&M) and is a prototypical NT in the NFL. He is built low to the ground helping him play with good pad level and is very strong at the point of attack. He is very good at taking on double teams and I think he is well suited as a two-gap player. He is exactly what you want from an early down NT. What I love about Mack though is his potential to be a disruptive force in the middle. He has as explosive a first step as you will ever see from a big interior DL. This paired with his strength give him an excellent bull rush which proved to completely unstoppable in 1 on 1's at the Senior Bowl. As well as being a good two-gap player, Mack's explosion and quickness off the snap also allow him to shoot gaps and knife into the backfield to make plays behind the LOS. He is very quick for his size, at times showing the speed to run down RB's from behind. He doesn't have a lot of pass rush moves right now, but if he can develop those to go along with his strength, quickness and explosion I think he has a chance to be a special player. Ive really liked Jones for a while now but not sure hes worth the pick w Brady wanting to play. Idk we had some ammo last year in a loaded class & took "win now" guys. Those picks esp early weren't projects so I'm thinking we keep that approach for another year. Jones is a great prospect though. Smart, tough, has big time leadership qualities. Great mechanics, esp his lower half. You can see the Cutcliffe effect. I've heard some blame Auburns OL for Stidhams shortcomings but Dukes almost got him killed weekly. Jones never showed me the awareness/pocket presence I want but theres not a lot else he doesn't do at least pretty well. I think that'll be the big question for Jones potential takers. As my Stidham I dont get the love. He just hasn't taken the steps or looked any different from year imho. JJ is a baller. Really interested to see him in the Underwear Olympics & how he performs. Unfortunately the tape shows he has a difficult time separating from coverage. I’ll pass. Whenever I think of a program holding a TE back I think Ben Watson. Oh yeah, from Georgia. I liked Butler a lot and also Andy Isabella. Polite from FL, White from LSU are two that jump out for me at this point. So many flash plays with both of them. Many weeks to go and much info to absorb, however. I saw the tread title and was going to say Butler, 6'6" WR with great hands. Imagine what Brady could do with Butler, Gordon, Edelman, Gronk, and White! I gully expect the Pats to double dip with this TE heavy draft. I think Butler will be around at #56 maybe even #64. It all depends on what he does at the combine. Right now they have him at 4.6 in the forty, if he runs under 4.55, he will vault up to the first round. My second fav is Jamal Custis from Syracuse 6'5" WR that is also a tremendous gunner on Special teams, he can be had in the 7th round. For once, give Brady a tall WR that can stretch the field, the last time you gave him such a player, he had 25 TD passes! There’s quite a few tall wrs in the draft. Antoine Welsley out of Texas Tech (welker and dola!) is an interesting one too. I don’t understand how fans are putting Gordon is our lineup. What in the past 5 YEARS makes you think he can be relied upon. Can't decide if this makes me like DK Metcalf more or less. Probably more. Too early to give binkys but players I've liked of the few I've watched so far include TJ Hockenson, Dexter Lawrence, Johnathan Abram and Nasir Adderley. Would love any as a Gronk/Brown/Chung/McCourty replacement/insurance. All in play at 32 for me (or with a trade up possibly). I still believe the team performed better after he left the lineup. I'm only looking at players who might actually be on the board at 32. He's big, strong, athletic, stops the run and can rush the Qb. Checks all the boxes for me at this early point.